Two weeks post-Hurricane Sandy, where in New York City can one host a banquet for nearly five thousand rabbis? Somehow Chabad-Lubavitch did. 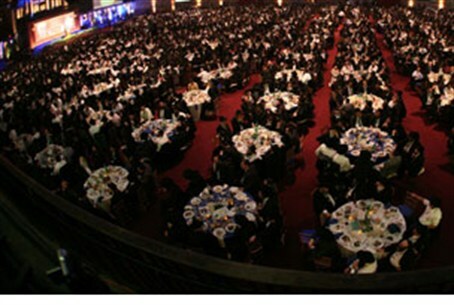 Two weeks post-Hurricane Sandy, where in New York City can one host a banquet for nearly five thousand rabbis? That was the challenge faced by Chabad-Lubavitch World Headquarters after Sandy devastated the Brooklyn Cruise Terminal in Red Hook, the venue set for the yearly international gathering. There was some discussion on various Chabad-Lubavitch websites over whether or not to hold the annual banquet Sunday evening following the devastation wreaked by Sandy and the nor'easter that followed. The much-anticipated event is the culmination of nearly a week's worth of workshops and seminars on the nuts-and-bolts issues facing emissaries in the field, and how to deal with what comes up as they serve the People of Israel "round the clock" while still trying to maintain a semblance of family life -- for many, in some of the unlikeliest places in the world. But the consensus was quickly reached that the vast majority of participants had already bought and paid for their tickets to arrive, including those who had invested hard-earned funds months earlier -- and the benefit to be gained by the gathering was far and away more important. One can find a Chabad-Lubavitch sheliach (emissary) in Nepal, China, Japan, Thailand, Mumbai, Montana, Cambodia, Congo, Hungary, Morocco, Bulgaria, Korea, Russia, Nigeria, Netherlands, Venezuela -- and of course in numerous locations in the United States, Canada, Europe, Australia and Israel. The list goes on and on. The terminal, which was set up to welcome some 4,500 rabbis and their guests from around the world, was completely trashed by the hurricane and the nor'easter that followed. Despite the best efforts of staff at “770” Eastern Parkway to work on ways to rehabilitate the facility in time for the convention, it quickly became clear another place must be found. Only one hotel in New York City features the elegance and quality of service – and size – that was able to contain a conference of this nature, according to the organizers: New York's Hilton Hotel. And even with that, sources said, nearly all of the hotel's ballrooms were put to use containing the thousands of participants who flooded into the conference. Smaller ballrooms on separate floors have been connected to the main event through video hookups in order to coordinate the entire affair. Thousands of Chabad emissaries from around the world have been flocking all week to the neighborhood of Crown Heights in Brooklyn, New York to attend the “Kinus HaShluchim” -- sometimes paying as much as $10 per gallon of gasoline to fill up a tank to get there, upon renting a car, after waiting in line at some gas stations literally for hours, by some reports. Others turned to friends with contacts on the rapidly developing black market, who are able to then supply with them with needed fuel to get them to where they need to go, sources told Arutz Sheva on condition of anonymity. Israel's former Chief Ashkenazi Rabbi Yisrael Meir Lau, however, spent a quiet Sabbath weekend on the Upper West Side resting up for his keynote address to the convention. The world-renowned rabbi had just ended a tour of South America. He spoke briefly at kiddush following prayers at the 84th Street shtiebel (small chapel) led by Rabbi Shlomo Besser. A worshiper at the synagogue told Chabad's COLLive site the famed Holocaust survivor told the crowd he was enthusiastic about the conference, and the chance to pay tribute to the emissaries.